Had a great time at FITC Wearables 2014 – congrats to Shawn and crew. It was good seeing old friend Computer Steve (Mann) who was doing the keynote. Also nice to meet Dr. Helen Papagiannis, Sheridan IMM (2001) who did a great job co-hosting the conference in digital dress (a MeU. Professor, Dan Zen, was there wearing Hangy trying to convince everyone they can just wear their current devices. Got to try the Muse and meet Kate Hartman. Loved seeing the Myo in action. It was great to see a bunch of IMM grads in attendance at displaying projects such as the award winning Sleepy Hollow Oculus Rift feature by Ryan Andal (IMM 2003) at Secret Location. IMM 2001 grad Matt Fabb also worked on that project. Our current students were out volunteering and connecting. Brain Controlled Artificial Intelligent Mobile Remote Virtual Reality Accessories! Sheridan Interactive Multimedia has a multimedia pioneering course that we have been running for almost 10 years. It certainly has been exciting keeping up with the near future for so many years. Some highlights for guest speakers have been: Bill Buxton, David Rokeby, Steve Mann, Vincent Jon Vincent, and dozens more. We make sure the students build prototypes in technologies like multiuser, gesture tech, mediated reality (augmented and diminished). We have prototyped tilt and multitouch for years – now these have moved into regular curriculum. For the last few years we have also run club projects where groups run a club for various technologies. For instance, last year we had Holograms, Reality Gaming, Ardino, Shape Recognition and Voice Recognition clubs. The year before that was Wands, Second Life, Augmented Reality, iPhone, and 3D Vision. http://www.falltourinteractive.com/ to many interactive agencies in Toronto. The class joined a couple hundred others to spend a day visiting studios and talking with representatives about our industry – an invaluable experience. Thank you very much to the organizers, volunteers and studios! We used this picture as a visual tour for the Lieutenant Governor of Ontario to show them some of the works of our students. For the presentation, we used a Flash AIR app called OrbitZoom (By Professor Dan Zen) to show the picture. Being an AIR app, it works on the desktop as an image viewer or can easily be converted to mobile as AIR is on or can be published to iOS, Blackberry Playbook and future Blackberries, and Android devices. There is a Web version CLICK HERE Click the picture zoom and click the picture to stop zooming. Press A for actual size – pan around by dragging. Double click to return to full picture. The Sheridan Interactive Multimedia one year post grad program is accepting applications for this September. Please see our site at http://imm.sheridanc.on.ca. 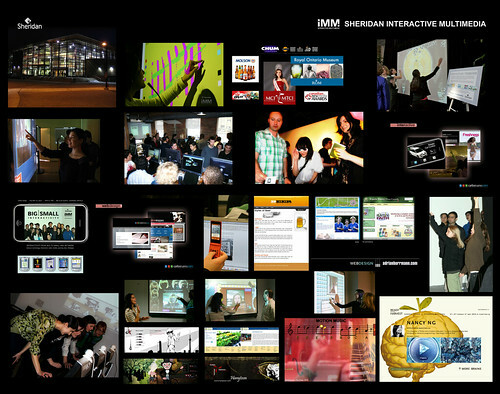 Sheridan Interactive Multimedia Open House Pictures! Sheridan Interactive Multimedia Open House was a success with many happy people making great comments about the work – congratulations graduates! A number of industry were there looking to hire and it was also nice to see future students getting an idea of what is in store. The complete set can be found on facebook and on Flickr. If you were there, please come in and tag yourself on facebook! There was a sheet with all the URLs of the grads – let me know and I can find it for you.